Once I decided to spend $300 on an electric dehydrator and fruit leather trays, I figured I'd better get my money's worth by figuring out what else can be dried. Although many fruits and vegetables (and even meats and fish) can be dehydrated, some dried foods taste much better than others. In general, Deanna DeLong writes that vegetables often aren't worth drying. Her list of excellent dried vegetables is very short --- garlic, onions, chili peppers, popcorn, and tomatoes. Vegetables that she considers good enough to dry include lima beans, carrots, sweet corn, horseradish, mushrooms, parsley, parsnips, green and red peppers, and sweet potatoes (as part of a leather.) Although DeLong thinks pumpkins and winter squash are not worth drying, I've read bloggers who swear by them, and I know my father's a fan of dried cucumber, so it sounds like there's some room for experimentation there. Fruits, on the other hand, are often excellent dried. 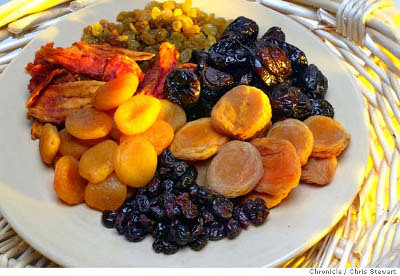 Since I love it so much, tomorrow's post will be entirely about fruit leather, but DeLong's top picks for fruits dried plain include: apples, apricots, cherries, citrus peel, dates, figs, grapes, kiwi, nectarines, peaches, pears, persimmons, pineapples, plums, and strawberries. In fact, the only fruits she recommends against drying by themselves are avocados, unprocessed berries (because of the seeds), crab apples (too sour? ), guava, pomegranates (seeds again), and quince (too sour?). Finally, if you've got a dehydrator, you might as well put it to use for other things. During the winter, the dehydrator makes a great place to rise bread (set it to 80 to 85 degrees) or incubate yogurt (110 degrees.) You can dry flowers at 130 to 150 or recrisp crackers at 160. Reliquify crystalized honey at 120 degrees for twelve hours, or make dog treats or a slew of craft items. And, of course, jerky is best made in an electric dehydrator. 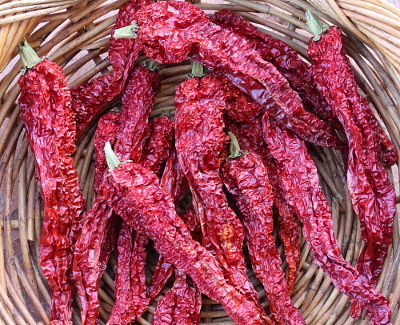 For those of you who've been experimenting with drying, what vegetables do you think make the grade? What's your favorite use for your dehydrator? Find out how to escape the rat race with our 99 cent ebook. Hey, what about zucchini and kale chips? Those are my fave ways to consume those two veggies. How do you make your zucchini and kale chips? Are they just the food, dried, or are they salted like potato chips? I don't know about drying slices of squash, but I make pumpkin-yogurt fruit leather that's pretty amazing. I mix vanilla yogurt and canned pumpkin in equal parts, add a smidge of sugar, and spread it around on the dehydrator trays. I do jam and yogurt leather too - I make my own jam (with about 1/4 of the sugar of most jam recipes) and mix it about 50/50 with vanilla yogurt. They probably won't keep very long, in or out of the refrigerator, because of the yogurt component. But they taste great! Your pumpkin/yogurt leather sounds delicious! I'll bet if I made butternut/yogurt leather with pie spices, Mark would be thrilled.